Blakely and I got together for our usual sort of game: Championship Rules and I spot her 100 points. We ended up on the infamous terrain with the impassable craters on either side and a hill in the middle. I forgot to snap a deployment photo, but it's pretty clear where things are. Note that we both has 7 units but I spent fewer points and chose to let her deploy & go first. Antonian Horsemen behind Battleaxemen, Militia, Spearmen, Longbeards, Longbeards, Battleaxemen. The Antonians started the same in the middle of the map and could zip to either side. 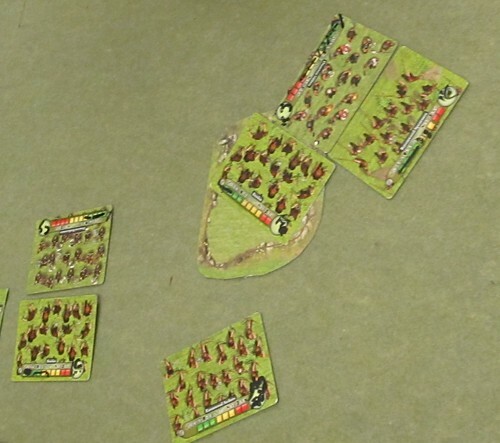 Blakely put two Longbeards in the middle of her line with defensively strong units to cover their flanks. Overall a terrifying army. Bear Pack, Bearkin, Bear Pack, Archers behind Bear Pack, (gap) Bearkin, Spearmen. Fear of a ballista kept the Treants away, though I wish I'd brought one here. As it was, I had nothing that could go toe-to-toe with Longbeards, so opened up a gap and hope that at least one would charge into emptiness while I got a quick breakthrough. 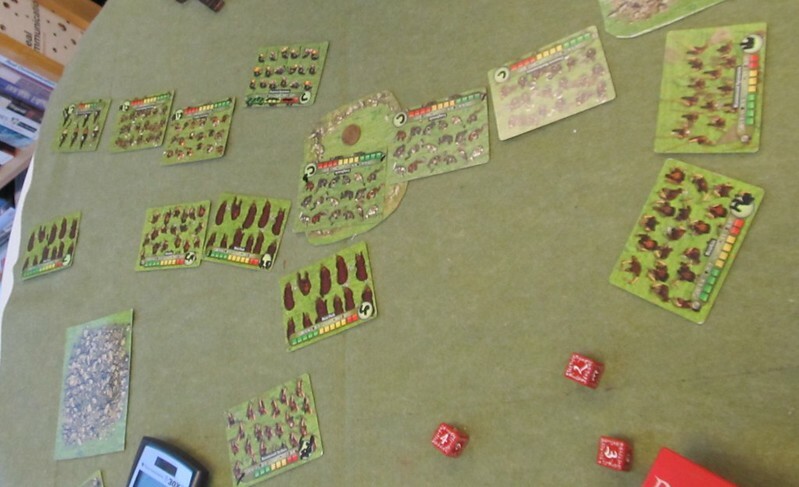 Archers were targeting the Spearmen and getting Spirit Guidance each turn. Blakely had the bad luck not to draw any courage boosters in her first cards. Archers softened up the Dwarf Spearmen; my Bears did a pretty lame first hit, with with no courage boost off the Spearmen ran! They survived with one hit point, and now there was a hole in her line and the whole game was about to get higgledy-piggledy. Bears to the immediate right are positioned within no-turning-back range of the Longbeards, but just out of range of the second Longbeards. Worth noting that each of us were spending a TON of Command Actions on Direct Controls and Order Changes this game. I let the Bear Pack charge the Antonians. 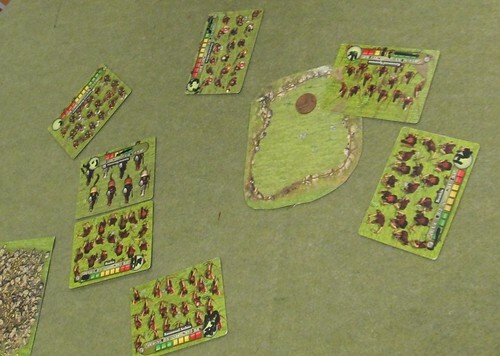 I figured the nearby Battleaxemen to pinch my Bears to death, but they'd then be out of position and far from the rest of the battle while the Antonians would be mauled and easy pickings for my archers. Then the Bears did zero damage, took 5 in return and routed! While they survive the rout Blakely's turn is coming up so they'll be tagged. Stupid Bears--I could've used Brownies. My Bearkin had been planning to beat up some Militia, but now those Battleaxemen would be coming their way...eek! Blakely is annoyed after spending a Command Action to rally her 1-red-box Spearmen only to have them picked off by Archers. Bears pinch the Longbeards. I'm furiously pitching-to-play good cards and the Bears take them down. Can't remember if the Longbeards routed in the red or just died on damage. Blakely's Longbeards are in position to flank my wounded Bear Pack, but my Bearkin are in Aspect-of-Wolf range of getting on their rear. My Bearkin are furiously backpedaling. The impassable craters are saving their vegan bacon, as otherwise they'd be easy pinch-bait for the Antonians. 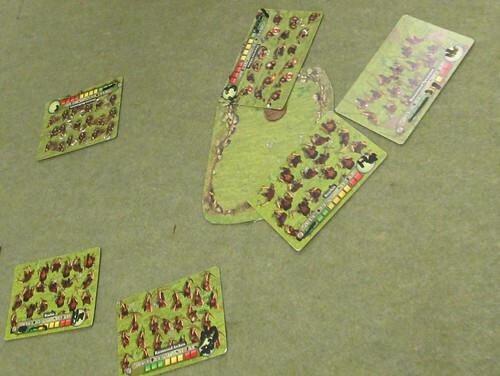 Archers bounced arrows off the Longbears, then put some insult-damage on the Militia. 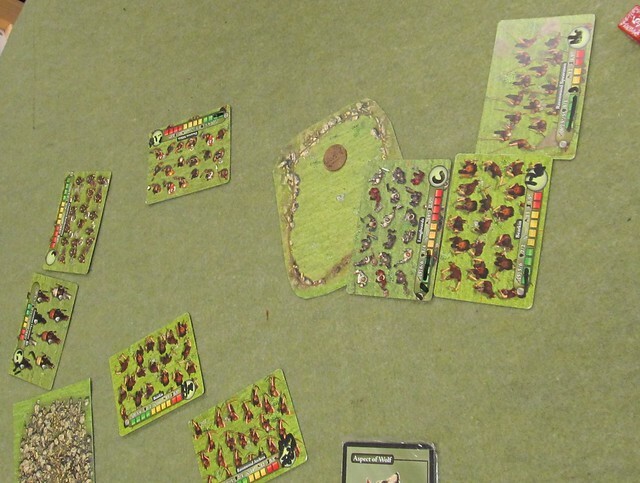 The Center-and-Right was mutually ugly: Blakely moved her Battleaxemen so as to prevent my Bearkin from goosing her Longbeards, but this meant allowing the Battleaxemen to be pinched and quickly destroyed. I meanwhile moved Bearkin onto the high ground, positioning them so that the Longbeards will get goosed if they attack. 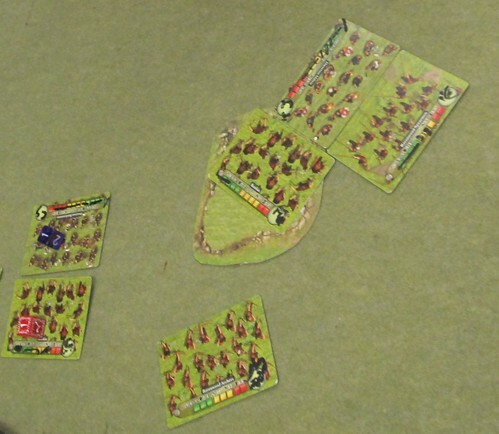 Longbeards hit them anyway, a decent roll did 5 damage, and my disgrace-to-courage-fourteen Bears run for it and pop! So I play Aspect of Wolf for +1 MC, and the Bearkin rear-attack the Longbeards--a fight they should win but will take some damage on the way. Spearmen are moving in for the pinch. Unable to get a pinch, Blakely sends the Antonians into my Bearkin. I play a good blue cards and the Bearkin hold on. They predictably win the grind vs. Antonians, who rout when they got into the red. Meanwhile, Blakely sends her Militia to the right to help, or at least avenge, the Longbeards, but my Bearkin-Spearmen rear/flank pinch takes the Longbeards down first and I'm able to reform them to face the attacker. Finally the units met and my dice went HOT! Batlleaxemen take 6 damage and are left with one hit point. Now even if they prevail they'll be easy pickings for my archers. With her Militia pinched and about to go down, Blakely conceded. 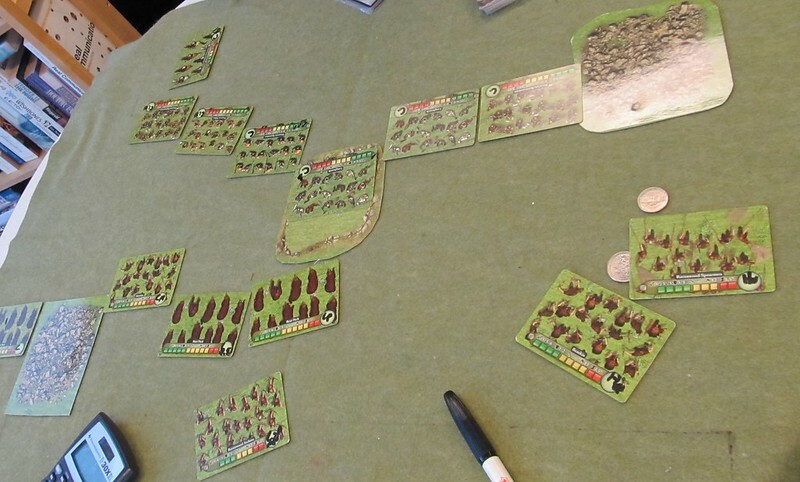 A fun, crazy game where comparatively few cards were drawn by either of us, and with most units falling to pinches or freakish rout check failures. Blakely played a solid game--the only mistakes I can see were not declaring Backup Rule at the end there and not sprinting her second Longbeards early on. But that's pretty minor and I'm still pretty sure that at least 75% of the time her Spearmen get a courage booster card, and stays in the fight long enough for my Bear Pack in the center to shatter and my lines to get ultimately crushed. Dwarves: I'll give it to the Antonian Horsemen for killing a Bear Pack while taking zero damage in return. They went on to soften up my Bearkin. Ravenwood: Giving it to the Archers. Their damage early on on the spearmen allowed for the early breakthrough, and their damage on the Battleaxemen in the end produces the white flag. Remind me again who was saying something about archers being too weak to be viable? Honorable mention to magic Spearmen/Bearkin duo do pinched away Battleaxemen, Longbeards, and Militia. I see the 2 of you really brought the beef here on this one. Go beefy troops! Fear of a ballista kept the Treants away, though I wish I'd brought one here. As it was, I had nothing that could go toe-to-toe with Longbeards, so opened up a gap and hope that at least one would charge into emptiness while I got a quick breakthrough. I let the Bear Pack charge the Antonians. 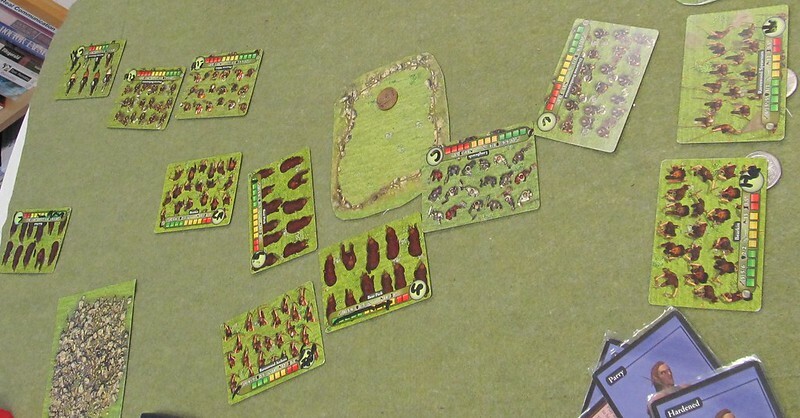 I figured the nearby Battleaxemen to pinch my Bears to death, but they'd then be out of position and far from the rest of the battle while the Antonians would be mauled and easy pickings for my archers. Then the Bears did zero damage, took 5 in return and routed! Holy worst case scenario Batman! Even with the bears honking the 1st attack I'd expect them to eat the Antonians in the long run. Most unfortunate. Ravenwood: Giving it to the Archers. Their damage early on on the spearmen allowed for the early breakthrough, and their damage on the Battleaxemen in the end produces the white flag. Remind me again who was saying something about archers being too weak to be viable?